view of A on firewall, handwritten on a Katzman spider. Lancia numbering systems are a study in themselves. 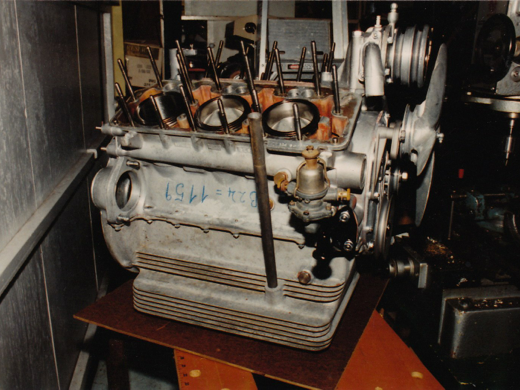 Consider the numbers on the Aurelia engine – the motor number is stamped on the block – sequentialLY (to motor production, not cars). Sometimes one finds an “A” stamped on the B24 block for Spider America, with its detuned, torquey cam. Matching the motor number to the car remains an arcane bit of Lancia knowledge only found after decades of experience. The oddities are also the amusing part – Steve Katzman has sent in pictures of a B24 block with the number written on the block, in blue pencil (shown above). Never seen that before. He also found an “A” written on the firewall, although the shot isn’t exactly conclusive…. Inside the engine, many parts are stamped or have numbers cast in. The radiator Y is most notorious, listing B20 or B24, or even Nardi’s name when he cast them. I think these are consistent, but there may be variations in them as well. Major machined parts are stamped: conrods are matched and stamped to each other and to the motor, as are main bearing caps. Water pumps have model numbers cast in their casing, but since the pump could be used in different models, a visit to the parts book is required to determine the right one for the motor. The historian looks for dates along with the stamps – and the heads are one of the best places to look. The engine blocks came in a number of different castings (last count was 6 different ones), anyone know if they are stamped anywhere? What means”numero scocca” does not means the number “telaio”? scocca is the number of the chassis, but is stamped low down on the firewall. It is not the more common car number stamped on the number plate, and also on the body, but is more obscure and less frequently-referenced.